The following calendar contains all of my group classes, events + workshops, and availability for private yoga instruction. Simply click the link to learn more about each offering. Class passes can also be purchased in advance through the website by clicking “Sign Up” next to each class. This will redirect you to another website - if you’d prefer to first open the calendar in a new window, click here. Odesza Slow Flow to Yin Yoga at RiNo Yoga Social - a monthly mix of movement and sound waves. Click the link below for details and tickets! As a Top Rated Dabble teacher, I host events around Denver and beyond! Check out my upcoming events below. To sign up for an event, simply click the link and follow the instructions to purchase your ticket. Join Liz Layne Yoga and Birdsall & Co. for a Spring Plants + Crystals workshop at River North Workshop on Wednesday April 17th at 6:30pm. As Spring has now arrived, we will usher in its renewing and re-energizing spirit by using crystals to support the growth of plants! We will explore the themes of spring and our own personal goals for the season (perhaps refreshing a space, spring cleaning, or growing towards a big goal!) and learn all about how plants and crystals can support you in this season. We will explore how crystals support plants, and each pot our own plant to take home with a crystal. Join Liz Layne Yoga + Megan of Mala Magick for an Introduction to Crystal Grids at River North Workshop on Thursday 5/2/2019 at 6:30pm. We will be making a crystal grid using the sacred Lemniscate shape (the symbol of infinity, a figure eight). This shape symbolizes completion, and shares a balance of the two sides - just like the balance in masculine/feminine, dark/light, yin/yang, and so on. This workshop takes place just after May Day (May 1st), also known as Beltrane. This Gaelic festival is halfway between the spring equinox and the summer solstice and represents the balance between the two. This crystal grid is perfect for finding balance, or for re-balancing areas of your life as you prepare for, or experience, transition. All materials are provided for you to make your very own crystal grid and take it home. Bring your curiosity, as well as any natural elements (such as a shell) or personal items that you may want to include in your grid! All materials are provided for you to make your very own crystal grid and take it home. Your investment of $45 includes tea and all materials to make your crystal grid. Join Liz of Liz Layne Yoga and Megan of Mala Magick for our monthly event, Malas + Meditation! 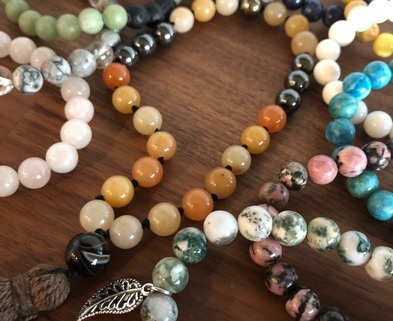 In this class we will learn all about the traditions of malas and mala-making, followed by creation of our own mini malas or mala bracelets with healing crystals. We combine mala-making with meditation based on a different theme each month. You'll take home your very own mini mala or mala bracelet to keep or to give as a gift! In May 2019 we will make mini-malas in place of bracelets (small versions of a mala necklace) with Carnelian for all of the C's (creativity, courage, confidence! )and Smoky Quartz for balance and harmony. We will learn how to hand-knot our mini-malas, and create them with a guru bead and tassel. They are great to keep on hand with you throughout the day for meditation - perfect for your purse, your desk, your car, and travel! After creation, we will learn japa meditation with our new mini-malas! In June 2019 we will create bracelets with Tiger's Eye for personal power and inspiration! These beads will encourage us to release self-doubt and negative emotions so that we may shine and inspire ourselves and others! Following mala-making, we will work through a light journaling exercise and drop into two meditations to embody our personal power. This *all levels* meditation class begins at 7 PM in the upstairs studio at RiNo Yoga Social. Arrive a few minutes early to check-in and introduce yourself to Liz & Megan, and then grab tea and mingle with the community! Space is limited for this event, so please register in advance. If available, we will have spots open on the day of the event until they sell out. 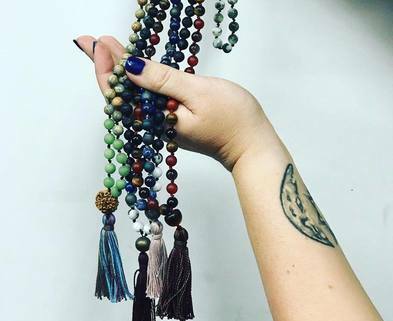 Megan of Mala Magick is a Colorado native who creates authentic gemstone malas for healing and meditation. She handcrafts each mala with intention. Find Megan on Instagram at @mala_magick! Liz (of Liz Layne Yoga) is a Yoga Alliance RYT-200 and Leadership Coach based in Denver, CO. With a focus on the mind, body, and breath connection, she guides her students through important aspects of life and yoga practice. Liz's yoga classes honor traditional awareness of breath & alignment while satisfying the curiosities of the busy Denver adventurer. Whether you join her class to release, renew, or relax, Liz's classes offer something for everyone. Find Liz on Instagram at @lizlayne.yoga and on the web at www.lizlayne.yoga! Join Liz of Liz Layne Yoga for a guided Yoga Nidra practice, specially designed for Dreamers and Visionaries! Yoga Nidra, also known as "yogic sleep," is an ancient practice in which we enter a deep meditative state of consciousness. In this state, we are fully relaxed but not quite sleeping. Our brain waves slow down, and our nervous system rests peacefully. This can be a state of deep healing and rejuvenation for the body. Inspiration. Wisdom. Creativity. Innovation. Vision. This class is for all Dreamers and Visionaries ready to cultivate these qualities within their lives. Come to experience the power of Sankalpa and Yoga Nidra heightened by the healing properties of crystals. Sankalpa, an intentional vow or commitment created straight from your heart, is integral to the practice of Yoga Nidra and together they can be an igniting force if you're ready to invite more of these qualities into your life or awaken these qualities if you feel they have been stuck, stagnant, or dormant within you. No prior experience is required! Students of all levels of yoga and meditation experience are welcome to join this class. During Yoga Nidra you will be guided through a profound journey of relaxation through a variety of techniques including guided imagery and body scanning. For most of the class time, you will lay comfortably in savasana - still, comfortable, and warm. Please dress in or bring anything that you wish for your own personal comfort - your favorite socks are welcome and encouraged!